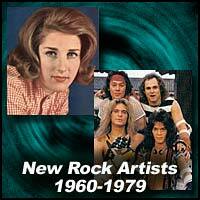 Criteria: Here are the top 5 new rock artists of each year. In order to qualify in a given year the artist has to have had his first ever release in that year (single, EP or album). The artists were ranked based upon initial popularity, lasting popularity, impact and influence of ONLY their records that were released in that calendar year.